The vertebral column is the most important collection of bones to maintain stability of the skeletal structure and support of the entire body, especially when upright. It is made up of 33 bones, known as vertebra (plural ~ vertebrae), which may be fused at certain points, like in the lower parts of the spinal column. 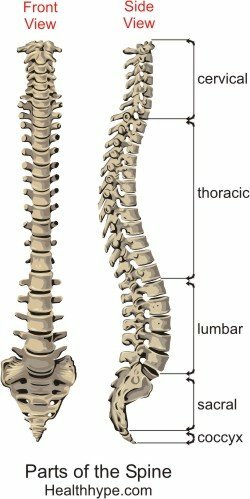 The spine is flexible because most of the vertebrae are separated from each other by an intervertebral disc, allowing articulation between the bones. The orientation of these bones is maintained by muscles and ligaments to give the normal vertebral column a typical S-shape. This shape is maintained by four main curvatures of the spine, known as lordosis (convex anterior) when it curves ‘into’ the body or kyphosis (concave anterior) when it curves ‘out’ of the body. Apart from the structural support function of the spinal column, it also houses and protects the spinal cord, which sends out branches (spinal nerves) to different areas of the body. The spinal cord is the neurological pathway for sending and receiving signals to and from the brain. This section is made up of 7 vertebrae (abbr. C1 to C7) and are the neck bones of the spinal column. The normal curvature of the cervical vertebrae is ‘inwards’ (lordosis). This section is made up of 12 vertebrae (abbr. T1 to T12) and are the chest back bones of the spinal column. The normal curvature is ‘outwards’ (kyphosis). These are the ‘fattest’ of the vertebrae due to the big body of each bone and this section is made up of 5 vertebrae (abbr. L1 to L5). The normal curvature is ‘inwards’ (lordosis) and is known as the lower back or abdominal back bones. These 5 vertebrae (abbr. S1 to S5) are fused into a single bone known as the sacrum. The natural curvature is ‘outwards’ (kyphosis) and is known as the central bones of the buttock. These are made up of between 3 to 5 vertebrae (usually counted as 4 bones) that are fused together and collectively known as the coccyx or tail bone.